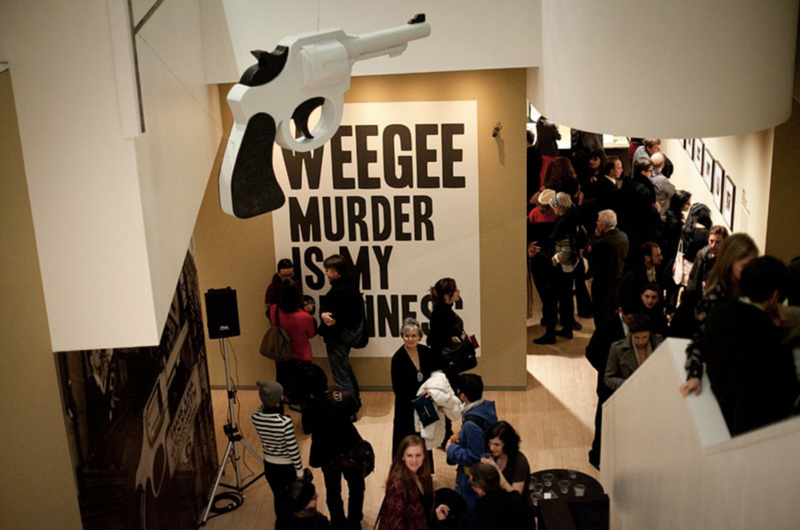 Opening night of Weegee: Murder Is My Business at ICP, January, 2012. One of my main tasks was to find replicas of all of the objects from Weegee’s 1937 bedroom (see picture to the right). For months I scoured prop shops, thrift stores the NYPL and the web to locate each item. A self-portrait of Weegee in his bedroom, c. 1937. This and another similar photo served as inspiration for the bedroom recreation featured in the exhibit. For an intense decade between 1935 and 1946, Weegee (1899 – 1968) was one of the most relentlessly inventive figures in American photography. His graphically dramatic and often lurid photographs of New York crimes and news events set the standard for what has become known as tabloid journalism. Freelancing for a variety of New York newspapers and photo agencies, and later working as a stringer for the short-lived liberal daily PM(194048), Weegee established a way of combining photographs and texts that was distinctly different from that promoted by other picture magazines, such as LIFE. Utilizing other distribution venues, Weegee also wrote extensively (including his autobiographical Naked City, published in 1945) and organized his own exhibitions at the Photo League. This exhibition draws upon the extensive Weegee Archive at ICP and includes environmental recreations of Weegee's apartment and exhibitions.